We all love taking pictures or have that one friend who is addicted to “selfies”. Pictures make us feel good about ourselves; we sometimes take them to keep memory of that one special time. We tend to keep or showcase them to the world as we upload them to our various social media pages like Facebook, Twitter, Instagram and so on. Sometimes however we take that one picture and one look at the photo taken and we realize that it could be a whole lot better if we do one or two touches here and there. Smartphones nowadays come with a photo editing app that supports filters and effects, which we access through the camera but it can only offer us so little, the filters and effects for most of the time isn’t top notch and so there is a need for us to find and download that one application which comes with so much features that make our pictures all the much better. So here is our rundown of the 10 best mobile applications for picture or photo editing on Android Phones. It finds its way to the top spot in this list of best app for photo editing on Android and it will come as little surprise. PicsArt has been around for a very long time and is an photo editing, collage and drawing application on Android. 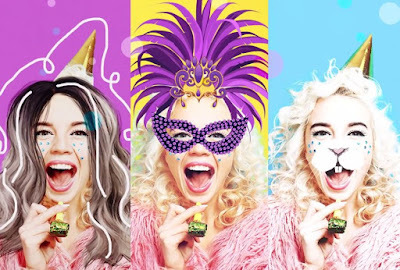 PicsArt enables users to take and edit pictures - filters and effects, draw with layers, reshaping tools and share their image with the PicsArt community, cloud storage and on other social media platforms. 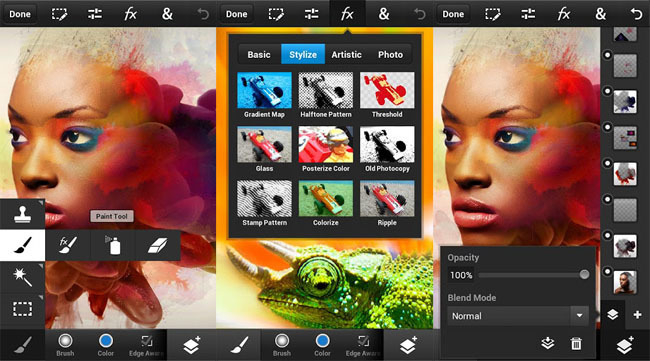 Launched in 2011 the photo editing app was downloaded 35 million times during its first year. Year to year it continues to have and achieve millions of downloads and active users. PicsArt has had over 250 million downloads to date and the developers always keeps it fresh and modern with updates. PicsArt has over 100 editing tool, adding of text, filters and effects , black and white, stickers, and has the option to generate animated GIFs and draw on your android phone and if that doesn’t reel you in then I don’t know what would. It is one of the best, if not the best mobile photo-editing application and it is a must have if you want the best out of your pictures. 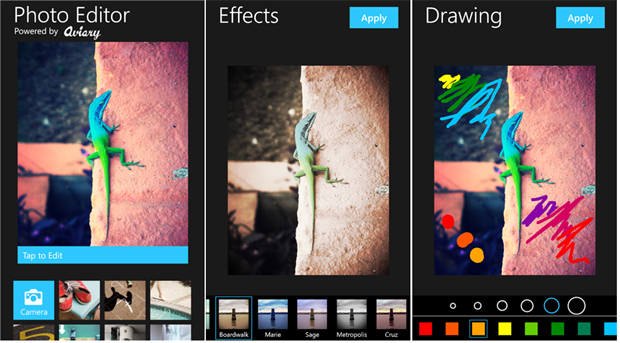 PicsArt is free to download on play store but offers in-app purchases. Snapseed is a photo editing application on Android previously developed by Nik Software and now owned and being developed by Google for iOS and Android that enable users to enhance photos and apply digital filters which you can also post on social networks, upload to cloud storage or save locally to your phone storage. Since its launch in 2011 Snapseed has grown to become one of the best and most sought after photo editing app on Android as it is free, has no in app ads and requests no in app purchases. Snapseed features include editing pictures with filters and effects, using swiping gestures to select different effects and enhancements. It can also save users editing history and redirect to any of the actions before. It enables RAW format photos which is an added plus for professional photographers. Images can also be tuned using a variety of sliders. Snapseed can also create and save filter combinations by using the default filters and editing features. 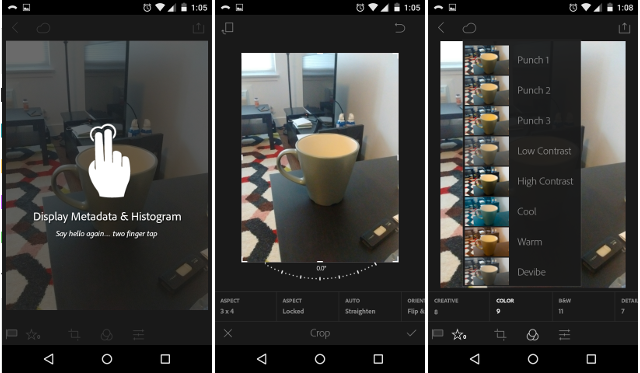 Snapseed 2.0 introduced new filters such as red eye removal, blur, glamor, glow, HDR scape and noir, black and white pictures, while also reformatting the tools section with a clearer user interface. It has been named one of the Top 100 Best Android App of 2015 by PC Magazine. Download Snapseed photo editor apps for Android phones on play store. Pixlr or Pixlr Express ranks high on this chart because of its popularity and its great photo editing tools for Android. Pixlr is a beauty photo editing app as it offers cosmetic editing tools like blemish removers, red eye remover, add text and teeth whiteners. Pixlr also has one of the best one-touch enhance tools. Its overlays and filters are quite nice and there are a large number of them. It also affords beginners a tutorial to put them on the right track with reshaping tools. You can stylize your image to look like a pencil drawing, an ink sketch, a poster, black and white with filters and effects. Photo collages can be created with various layout and background and colors can be balanced out in one click with the Auto Fix. It is an app that suits everyone’s need in every little way and so a must get for everyone. Pixlr photo editing app comes with a free download on play store and paid version. 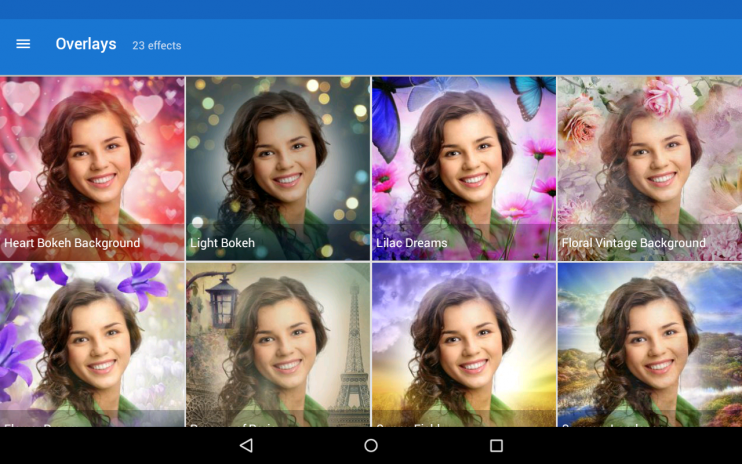 Having more than 800 million users, Camera 360 is quite the real deal when it comes to photo editor apps on Android. It is a camera application that offers tons of editing options for your Android device. 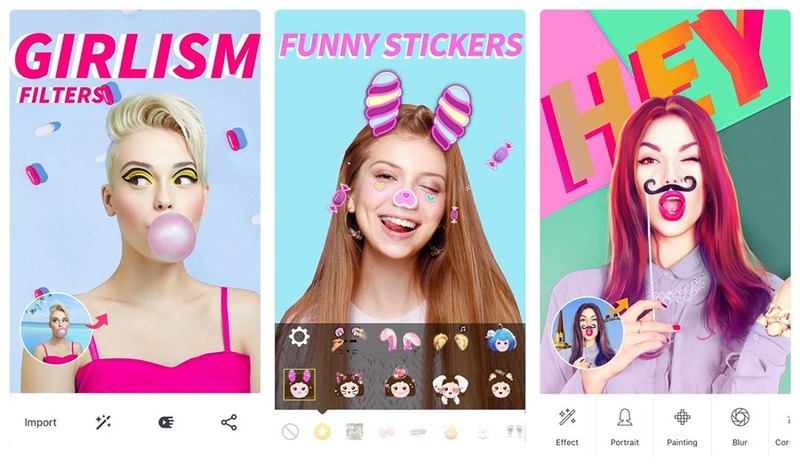 Camera 360 photo editing app has a visual homepage that is quite easy to use and stickers that make photo and video selfies all the more exquisite. It has a real-time makeup beauty camera that is best at reducing or increasing users eyes, white tooth, charming lips, black and white pictures, slim nose, red eye remover and so much more filters with effects. Most this feature is quite popular with the feminine gender. Camera 360 also has over 100 classic photo filters that make your photo editing experience on Android worthwhile. Camera 360 is free Android photo editing app and mostly for ladies who wants their pictures a little bit “makeup-ish”, as it easily beautify pictures and removes red eye which you can also share on social networks like Instagram. Download Camera 360 photo editor apps on play store for Android phones. This photo editing app is mostly for video and picture collage making on android but can also boast a photo editing option. Photogrid is quite popular with downloads and active users ranging in millions in the Android playstore. Instagram users are quite conversant with Photogrid photo editing app as it affords users the option to fit their pictures into the right Instagram ratio. 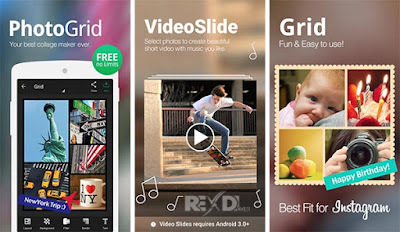 Photogrid has a simple interface, powerful photo editor apps tools on Android to help create stunning pictures, along with abundant materials like stickers, filters, black and white pictures, background, posters, filters and effects. It can also combine videos and photos with rich layouts. 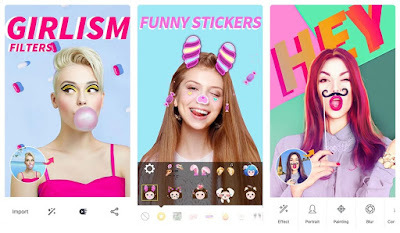 Photogrid is also used to create memes and slideshows as you transform photos into a music video which you can post on your favorite social networks. Download Photogrid photo editing app for Android phones on google play store. You might be probably wondering why Photo Lab is on this list of best apps for photo editing as it is not a very popular photography editing application. I’ll tell you why. While not being the best or the crème de la crème of photo editing apps for Android I felt the need to include an application that is rather quite simple to use with a friendly user-interface. Those not big on photography but want to get their pictures edited on their Android phones from time to time could get this photo editing app as its quite a good one. It has over 600 filters, frames, filters and effects such as black and white pictures, also enables users make basic photo edit adjustments, add text and so much more too. I experimented with Photo Lab after coming across it in an article and it impressed me much. There is a free and pro version but this photo editor app just sits well for users who just want a light photo editing for their pictures on their Android phones. Download Photo Lab photo editing app for Android phones on google play store. Developed by Aviary, Inc. and now owned by Adobe System, Aviary is a popular photo editor application for Android phones that offers reliability for photo editing tasks with its user friendly feature set. Aviary features one-touch enhance mode but you only get the real deal of this photo editing app when you experiment with its numerous manual adjustment features which can let you adjust colors - black and white, contrast, reshaping tools, exposure, temperature, brightness, saturation, filters and effects. The Aviary platform is also a free SDK that provides developers with the best customization photo editor that can be embedded into apps on iOS, Android, Windows, OS X, and the web. This photo editor app has a whole lot of stickers, adding of texts, cosmetic tools, advance filters. The free version fits the need of the simple smartphone users and social networks lovers, who just wants to get their photo a little bit touched up while those into professional photography can get the paid version that affords more room for customization. Download Aviary photo editing app for Android phones on google play store. 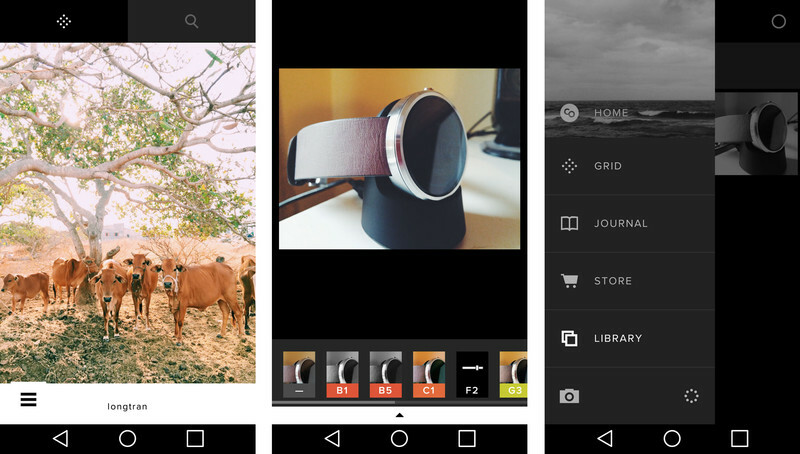 Formerly known as VSCO Cam, VSCO is a mobile photo editing app developed by Visual Supply Company an American company. VSCO is the best at taking in-app pictures or import photos from the camera roll users then edit their photos through various preset filters and effects, or through the toolkit features which allow finer adjustments, to fade, clarity, red eye remover, skin tone, tint, sharpen, add text, shadows, saturation, white balance, temperature, exposure, reshaping tools and so on, also supports direct uploads to social networks. It offers a minimal user interface, the editing tools provided are quite vast and easy-to-use. VSCO although requires you to make in app purchases which could be a bore sometimes. It has a special feature for iOS users as short videos or animated GIFs can also be imported or uploaded on cloud storage. If you want your photos or videos having that vintage feel and an easy file sharing then VSCO is your go to app.VSCO is absolutely free to download too. 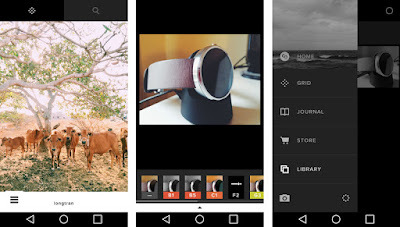 Download VSCO photo editing app for Android phones on google play store. Adobe Photoshop is a classic and unarguable the best photo editing software for PC users. Photoshop has been the go to app for photo editing by professionals, budding professionals or individuals that just want to experiment with the app because of its numerous features it affords. Does it however have that quite impact with mobile users ? The question is quite rhetorical but Photoshop has had its influence in the mobile phase as it still renders a bit of the photo doctoring as it does on PC one of the major reason that had seen its usage become rapid and it is best the photoshop app for android you can download for free. It has the professional feel as it help to create studio-caliber collage with lots of filters and effects. Photoshop has a simple and intelligent layout and has a 1-tap file sharing option. Photoshop can be used to create and save your own look and also import and edit photos in raw formats. It is an app that will certainly suit everyone’s need and Photoshop popularity over the years has made it sought after from professional photographers to thrill-searching users and even the simple smartphone users. Download Adobe Photoshop photo editing app for Android phones on google play store. You might be wondering why Adobe Lightroom is down this pecking order. 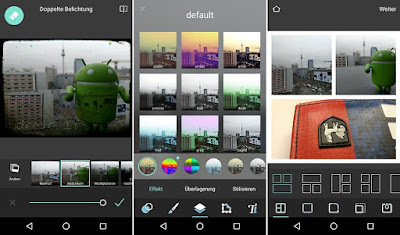 It’s not that it’s a bad application for photo editing on Android phones but Adobe Lightroom was developed by Adobe Systems majorly for Windows and MacOS - Adobe Photoshop Express before being integrated to fit for Android mobile devices. Adobe Lightroom offers a powerful set of photo editing tools, one-tap presets for quick edits, advance edits using curves and color mix tools, Adobe Creative Cloud for syncing your photo edits between phone, computer and web. Adobe Lightroom however has a simple user interface and navigation is fairly easy and it comes with a built-in professional camera mode that can capture image in RAW format. This whole ton of features and the filters that range in the thousands makes Adobe Lightroom more of a professional photographer application than that of a simple smartphone user. It can also be modified so that beginners that want to get the professional feel for their pictures can have that. The photo editor app is free but to upgrade to the premium version cost a fee. The premium version gives you access to the best tools such as selective adjustments and perspective correction and so much more. Download Adobe Photoshop Light room photo editing app for Android phones on play store. This rundown is the opinion of ours and not necessarily a fact. If you feel any good app for photo editing on Android was skipped you can tell us in the comment section below. coming near near post. Thank you one million and please keep up the rewarding work.